Another week, another Monday. Boy, how they roll around so quickly! Hopefully, you've had a large cup of coffee by now and are ready for a fab week ahead. 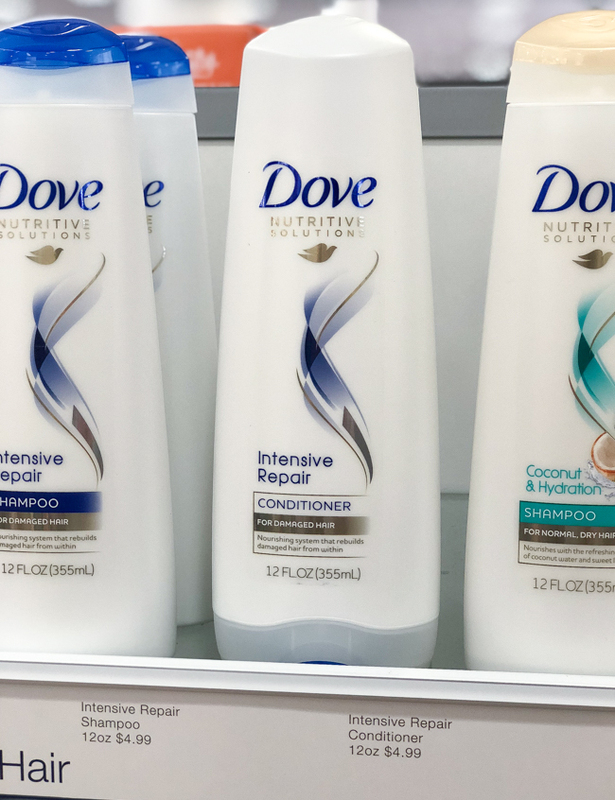 I've had SO many questions lately about my hair and what products I use that I wanted to share a new shampoo and conditioner by Dove I picked up at Ulta. My goal is to always give you lots of options and reviews so you can choose what's best for your routine and your hair. Today's products come at an amazing price point and are also formulated to take good care of your damaged hair - and who wouldn't want that?! If you've been following me for a while you know I'm quite the beauty enthusiast which means I make lots of trips to Ulta. Luckily, we have a store right down the street which makes trying new things easy. 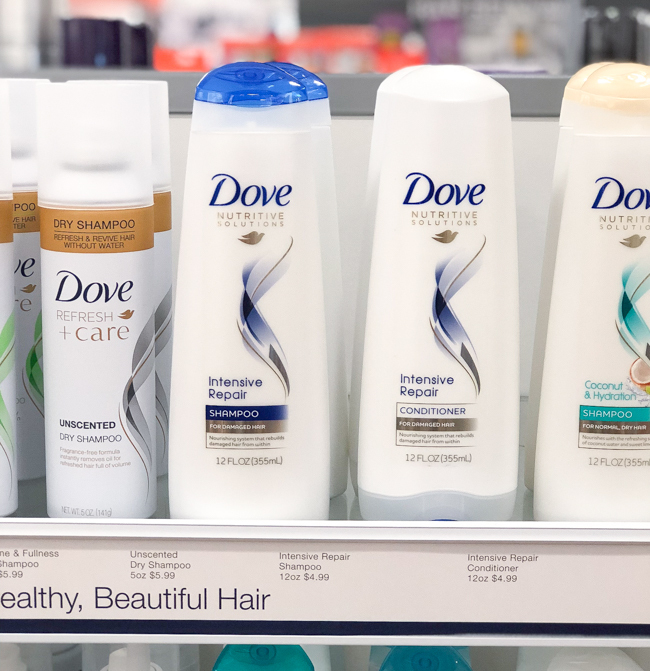 Recently, select Ulta stores started carrying Dove Wash and Care products that can be found in the hair care section. 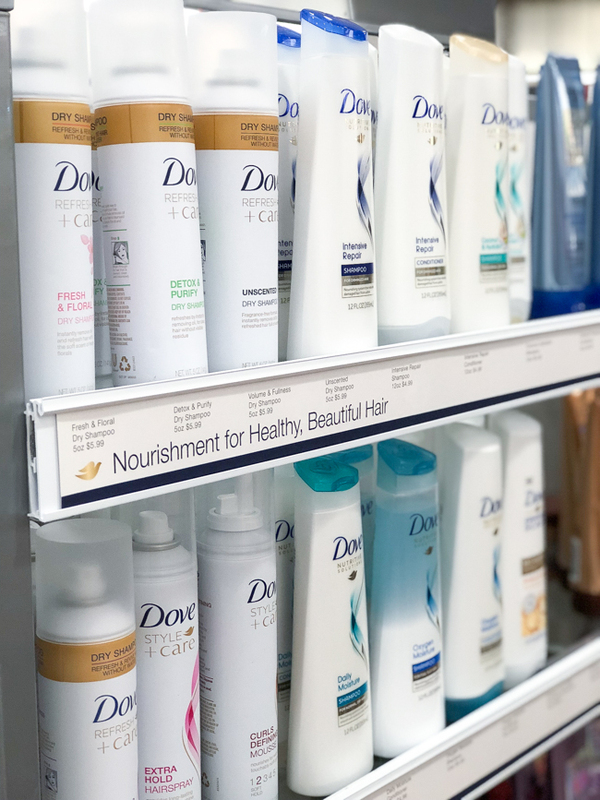 Not only do they offer shampoo and conditioner for damaged hair, but for hydration, dandruff, and moisture, in addition to dry shampoo (it's really good! I own this too), hairspray and curl mousse. So many things to choose from! 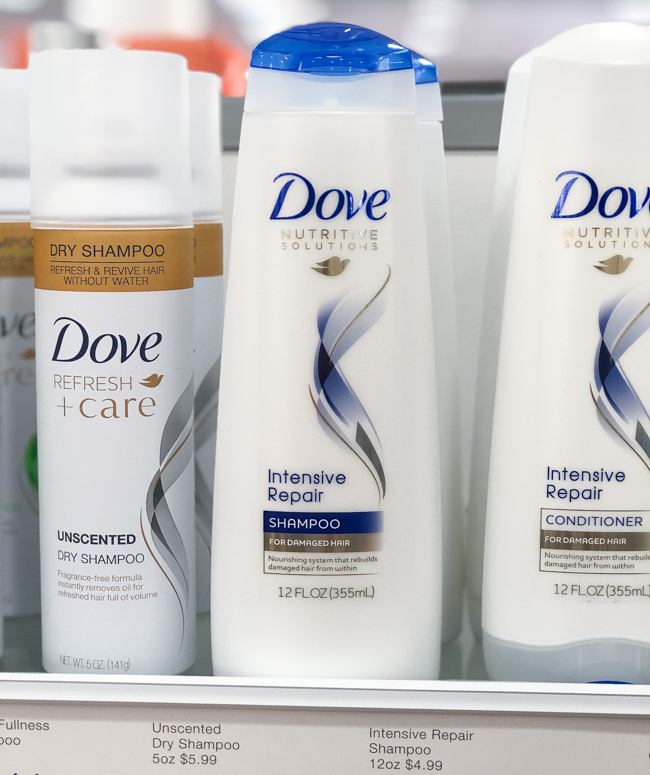 Today, I want to talk specifically about Dove Nutritive Solutions Intensive Repair Shampoo and Conditioner because I style my hair with heat daily, I color it regularly, and winter is also very drying. 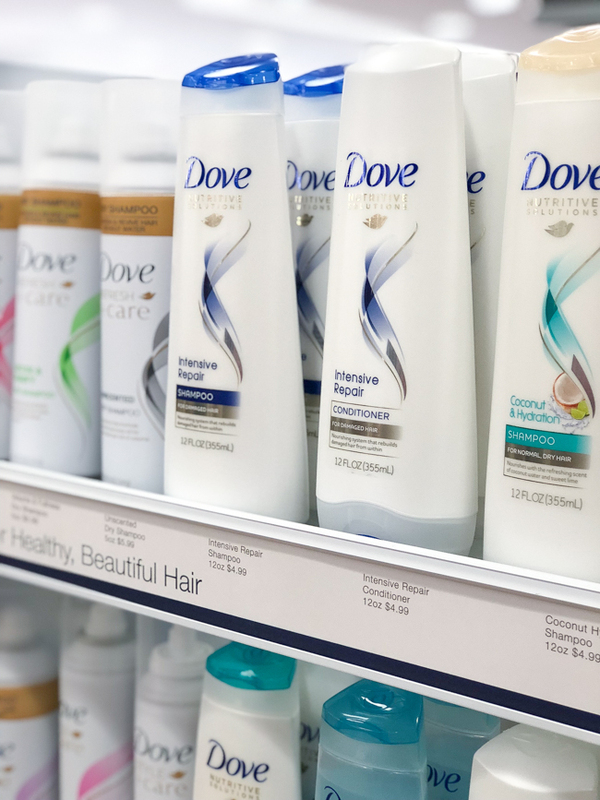 I've always had a positive impression of Dove as I've used their soap on my body for literally as long as I can remember. So when they came out with a new hair care line I had to snag some for myself. They offer such clean, caring, thoughtful products. The Intensive Repair Shampoo is formulated to treat heat damaged hair, like my own so it's stronger, and looks healthier. Lots of heat can cause breakage, especially to the ends of your hair (oh hello, split ends) and this product helps to protect against it. 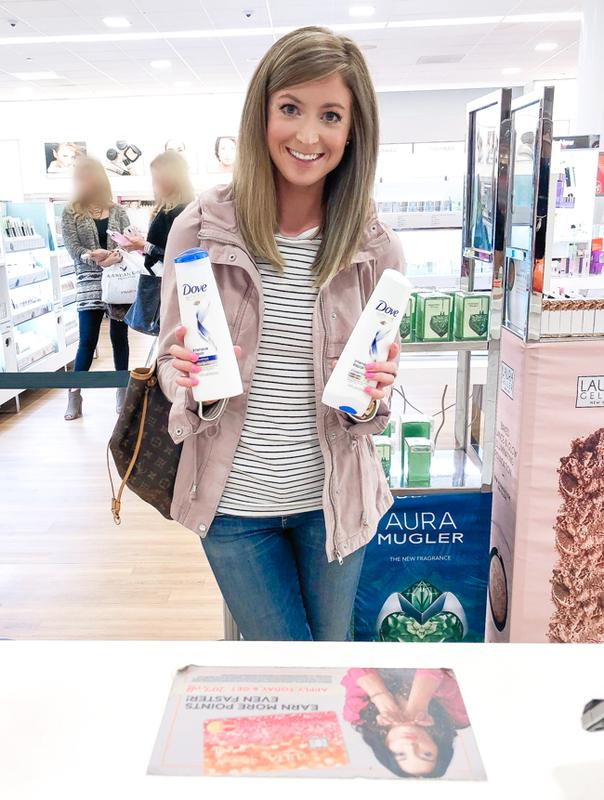 The unique formula with Nutri-Keratin Repair Actives is shown to visibly repair locks after continued use - like all things, you need to be consistent! It repairs surface damage to create smoothness and penetrate the strands for healthier looking hair. The Intensive Repair Conditioner helps to restore hair inside and out. I know when I think of conditioner, I think smooth, and this is no exception. Like the shampoo, it visibly repairs damage and strengthens against heat, styling, and weather. This product contains the same Keratin Repair Actives to penetrate strands progressively nourishing with each wash. I particularly like that each wash means healthy hair since over-washing can strip hair of natural oils. If that's the case for you, or you have a hair type that requires daily washing, I definitely recommend this pair. In addition, I've had several questions lately about how to keep hair healthy if you have to wash and style it every single day. And to answer this question I would highly recommend trying Dove's dry shampoo to extend your hair by a day or two. It's better for your hair and I've found it actually makes the hair feel cleaner. 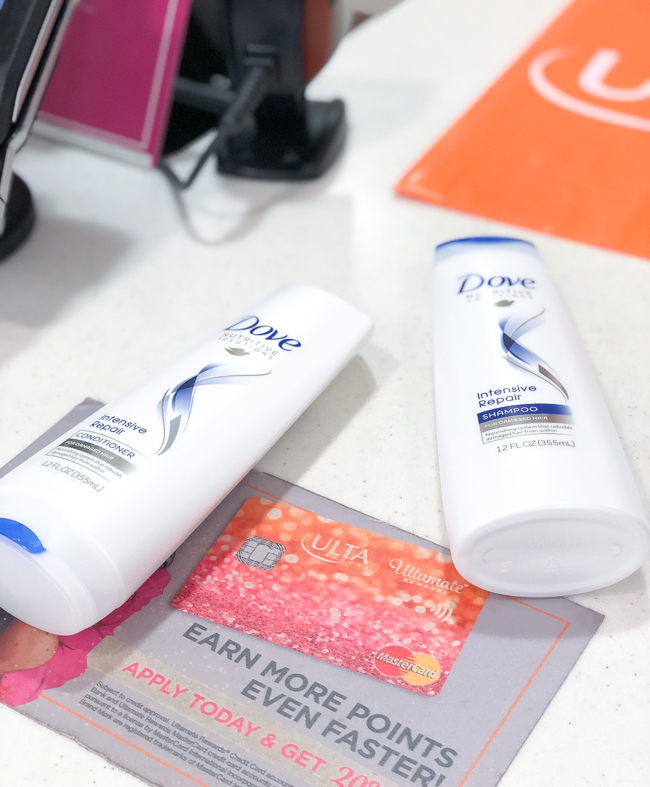 Y'all know I love to highlight discounts and deals so from today until March 10th you can buy 2 Dove Hair products for $10. Additionally, since these products are only available at select Ulta stores, make sure you check the product page on Ulta.com's "Find in Store" feature. Fun side note: The girls in Ulta were so nice to take my photo purchasing at the checkout counter. I was worried they would be so confused about why I was taking pictures of what I was buying on the counter and snapping photos in-store. The line was super long when I went to the register and they were so patient and happy to help me. They even had me write down my blog and Instagram so they could check out this post! So if they are reading this, "Thank you!"